Sophomore guard Lexus Levy looks for an open teammate during a game against Towson in November. Fresh off its first victory of Atlantic 10 play – and first road win of the season – women’s basketball (4-11, 1-1 A-10) returns home into a difficult matchup with the Dayton Flyers (7-6, 2-0 A-10), who were picked to finish second in the league’s preseason poll. The Flyers have only missed the NCAA Tournament once since 2010 and won the regular season championship last year holding a 15-1 conference record. Dayton will be looking to avenge last season’s loss to the Colonials in the A-10 Tournament semifinal round, when GW upset the top-seeded Flyers in a 58–53 win to advance to the A-10 Championship game. Both teams kicked off a difficult non-conference schedule, with Dayton facing the likes of Green Bay, South Carolina, Maryland, James Madison and Virginia Tech. The team also captured a victory over ACC foe Georgia Tech, but the Yellow Jackets defeated the Colonials in their Thanksgiving Day contest. Saturday’s contest will be the first of two meetings scheduled between the two teams this year. The Flyers have outscored the Colonials by an average of more than 15 points on the year, so GW should play to its strengths and rely on a defensive game plan to stay competitive. Sophomore forward Neila Luma and sophomore guard Lexus Levy displayed career-best scoring efforts Wednesday, and both players will need to show off similar performances if the team wants to improve on a 3-5 record at the Smith Center, where they were 8-8 last season. 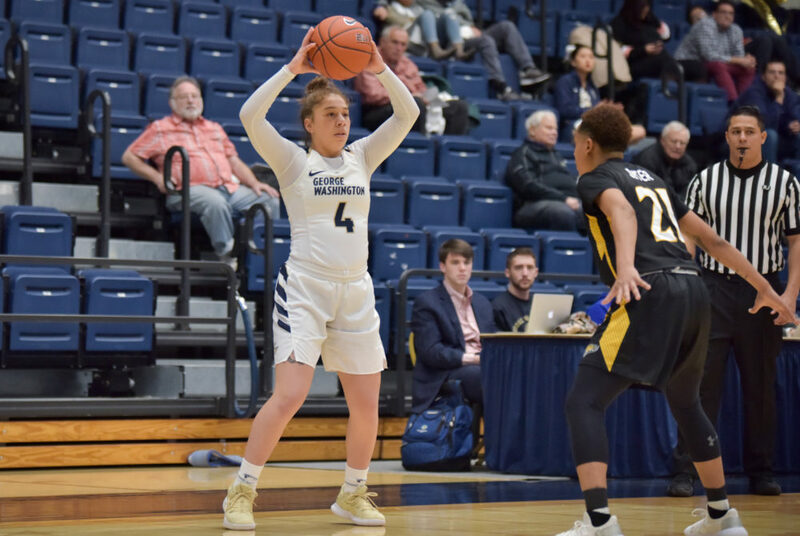 Levy, who hardly saw the court for a stretch of the non-conference schedule, has played double-digit minutes in five of her last six contests. Primarily a three-point shooter, Levy provides a much-needed scoring punch next to senior guard Mei-Lyn Bautista, who has done most of her work on the defensive end and as a facilitator in recent contests. At 9.9 points per game, Luma – who has found herself back in the starting lineup – leads the team in scoring and will likely do so for the remainder of the season as the team’s most versatile option on the offensive end. GW limits opponents to 58.7 points per game and forces opponents to commit 14.1 turnovers per game. If the Colonials’ offense can match their defense, Saturday’s game looks to be a tight contest between the two programs. The Flyers are also prone to fouling, leading the conference with 20.2 personal fouls per contest. The Colonials are the worst team in the conference from the free throw line, converting 61.4 percent of their opportunities at the charity stripe into points. Dayton will most likely be giving away free points to the Colonials Saturday, and if GW hopes to take advantage of Dayton’s aggressive defense, it must improve from the charity stripe. Dayton has yet to win a game on the road this season, which could also play in GW’s favor. Dayton’s shooting depth and overall experience will be a tough test for the Colonials. All five starters for the Flyers are third-year players or older, making them one of the most experienced squads in the conference and giving them an advantage against a young GW team. In their last two blowout wins, the Flyers utilized 12 players in each game and leaned heavily on their depth so the Colonials should expect more of the same if they fall behind early. The Flyers have won five of their last six outings and head to the Smith Center on a three-game win streak. Dayton’s two conference home wins, over La Salle and Massachusetts, have come by 39- and 28-point margins, respectively, meaning that the Flyers will have fresh legs coming into Saturday’s matchup. Dayton will likely start junior guard Jenna Scaife, senior guard Lauren Cannatelli, redshirt sophomore guard Araion Bradshaw, junior forward Jordan Wilmoth and redshirt junior guard Brittany Ward. Scaife and Cannatelli are the team’s go-to options. The 5-foot-10 Scaife leads the team in scoring and rebounding at 15.3 points and 6.3 rebounds per game to go along with 37 percent shooting from beyond the arc. Alongside her, Cannatelli averages 12.2 points per game, although she has struggled from distance this season, making just 28-of-88 attempts. Bradshaw, a point guard, is a transfer from South Carolina who was part the team that captured a national championship victory over Mississippi State in 2017 and her 3.9 assist-to-turnover-ratio ranks third in the A-10. The 6-foot-3 Wilmoth and 6-foot-1 Ward round out the starting lineup as complementary pieces who add size to the lineup. Redshirt junior forward Julia Chandler, a Syracuse transfer, is third on the team in scoring at 9.5 points per game, but she moved to the bench at the start of conference play with Ward replacing her in the starting lineup. Chandler and redshirt junior guard Shakeela Fowler give Green two players of starting-caliber off the pine. Scaife and Cannatelli are the most capable of taking over games, as evidenced when they combined for 51 points in their win over Georgia Tech at the West Palm Beach Tournament. Bautista – who held Fordham’s leading scorer redshirt sophomore guard Bre Cavanaugh to 12 points – and senior guard Anna Savino will have their hands full on Saturday in the backcourt. The Colonials will have to play their best offensive game of the season to defeat Dayton, but they have shown flashes of their potential at times. Saturday’s contest figures to be a low-scoring slugfest between two excellent defensive teams, a style of play which favors Dayton, the higher-scoring team.